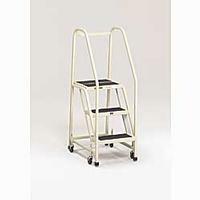 Attractive colors combine with strong durable construction making this ladder ideal for both industrial and office use. Rigid 1" dia. square steel construction supports up to 450 lbs. Steps feature rubber tread for safe footing, and the gradual incline eases climbing. 3" rubber casters retract automatically when weight is applied to first step so rubber tipped legs grip the floor for stability. Steps are 16"W x 7" deep with a 14" deep top step. Meets OSHA standards. Enamel finish. Four COLORS: BK - Black, BL - Blue, GY - Gray, SD - Sandalwood. 1-3 STEP MODELS ARE FACTORY QUICK SHIP. All FOB WISCONSIN.